A bit late as always but I thought I would tell you about my fabulous birthday. It was two weeks ago now but I have only just uploaded the photos onto the computer as I have been too busy with work. It was such a beautiful day and my lovely fella decided to take me to one of my favourite places for the day. 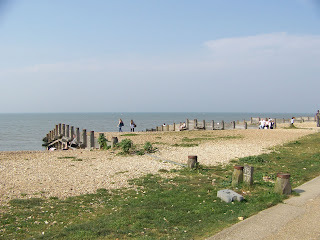 Whistable is so beautiful, I love to be by the sea plus it has great food and some good shops so what more can you want. We walked all the way along the beach before stopping in a beachside restuarant for fresh seafood. I had shrimps and then local fish and chips washed down with a local cider. After lunch we went to some shops and the looked in some estate agents, as is the done thing if you belong to my family. I would love to live here, some of the houses here are beautiful, there are some renovated black weatherboarded fisherman huts which are just my ideal home. In the late afternoon we went off to my family home in Kent to open my presents (WOOHOO) and then eat more food, this time a chinese, and of course the obligatory cake. My bro is the king of the cake and I have previosly requested an amazing sounding cake that we found in one of his cook books. It did not disappoint. 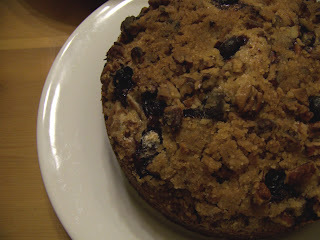 Blueberry crumble cake is what it was called but it was so much more. Moist blueberry cake topped with a pecan crumble, we had it warm with cream but I had some more cold the next day and it was just as delicious. God I love cake, I want some more now after seeing this photo. Thanks to everyone who sent me birthday wishes and to my wonderful friends and family for spoiling me as always. Now I will stop or this runs the risk of me starting some oscar speach and naming everyone I have ever met. That cake sounds amazing - where can I find the recipe for it? I am jealous Jennifer, living in london means I am pretty far from the sea.